How to Become an Auto Broker and How to Get a Dealers License. Super Low Miles? Be Careful! 2005 Mercedes E320 with 12K Miles!!! The seller wants $25K. Once again.. BE CAREFUL here. The EXTREMELY low miles (12K for a 2005) is tempting. I know. I get it. BUT… the buyer usually wants WAY WAY WAY more for the car than it is worth IN MY OPINION. I don’t mind paying a little premium for good miles but you’ve got to be careful. I see new guys make this mistake a lot too! Let’s look at this deal closer. 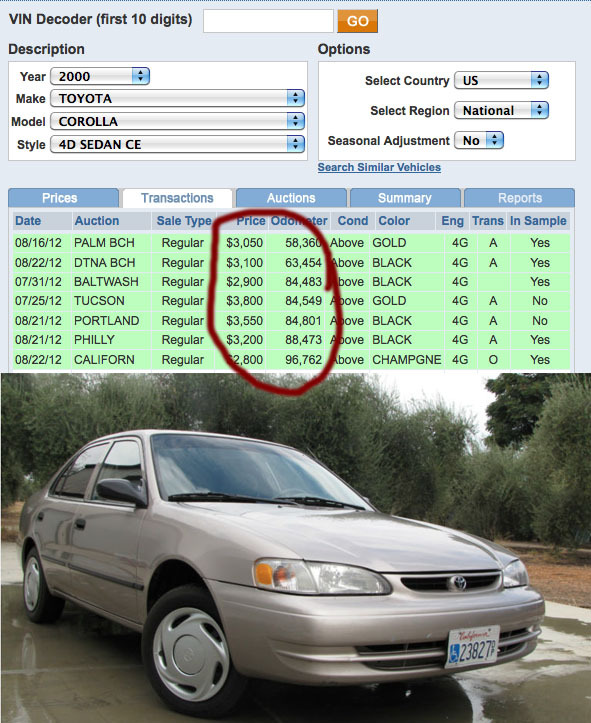 This car with 70K miles is worth about $14K wholesale (see red circle). As a good rule of thumb, ‘good miles’ is worth about $1000 per 10K miles. So, lets sat the car is 60K miles to the good. That is a $6K add. So, $14K + $6K = $20K wholesale. This seller wants $25K. That is $5K OVER. I could buy a 2008 with good miles for that money! As a bonus observation, if you are selling a high end car, take it’s picture in front of a high end home! Nice touch. 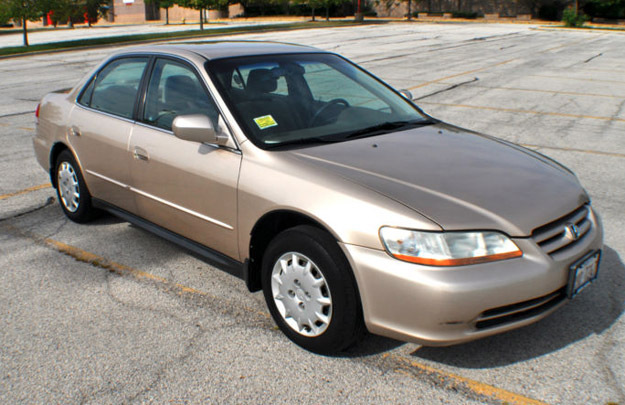 2000 Corolla CE – 4 Door. 81K. Auto. Cold AC. I LOVE these easy deals! I love love love cars under 100,000 miles. Easy to sell. Give me a break, a Toyota under $5000 and 100,000 miles. A no brainer!!! You could make your entire living JUST selling this type of car! Pay $3500. Spend a couple hundred for new mats and wheel covers. Sell it for $5000 everyday of the week! Clean it up to a SHINE. The more it shines, the money it brings, PERIOD. $1500 profit. Sign me up! Simple as apple pie. Hi, my name is George Dean. I am known for my down-to-earth, tell-you-how-it-is Auto Dealer Training Program. I am famous for helping absolute beginners get started buying & selling used cars for maximum profit. My years of expertise & acclaimed program will help you build a profitable car business without making expensive stupid mistakes. I have been offering start-up training for new dealers, wholesalers, and auto brokers since 1997. In that time, I have trained hundreds of dealers and I’ve seen nearly ALL the mistakes new guys (and ladies) make when starting out. Heck I’ve made every mistake there is, so please, learn from our mistakes. Imagine this… You walk through the front door of the dealership and ask for the owner. He approaches and asks, “What can I do for you?”. You awkwardly respond with the question you have rehearsed over and over, “Will you teach me how to buy and sell used cars for profit?”. The owner will have a great bid ole belly laugh. You will be laughed right out of the dealership. No one will reveal these secrets. The business is just too profitable to invite more competition (why do you think the industry requires a license? They want to keep you OUT!). Well, I am on your team. I am here to help SO if you have a question, ask me any question. I am here to help – truly. ARE YOU BRAND NEW? No problem! This means you don’t have bad habits! I do recommend you start smart by starting small. Making safe decisions avoiding classic beginner mistakes. Let me tell you, it is pretty easy to make a stupid/avoidable mistakes in this business. Let me guide you! You will learn how to do this business the RIGHT WAY without making those stupid mistakes! LET ME BE BLUNT Firstly, One thing you will always get from me is ….. the straight up BLUNT truth – whether you like it or NOT. Secondly, I’d rather you NOT invest in my study course if you are lazy and small minded – I don’t have time for people like that in my life. HOWEVER, if you are upbeat, positive, got some money to actually INVEST in your business, and you want to get involved in this amazingly profitable business, I am here to help! I have trained new dealers, brokers, and wholesalers since 1997. Most of the people I train are great spanking new in the car business. They need someone to break down the process into simple easy-to-understand steps. That is where I come in! I am GREAT at breaking down a process into SIMPLE EASY steps. 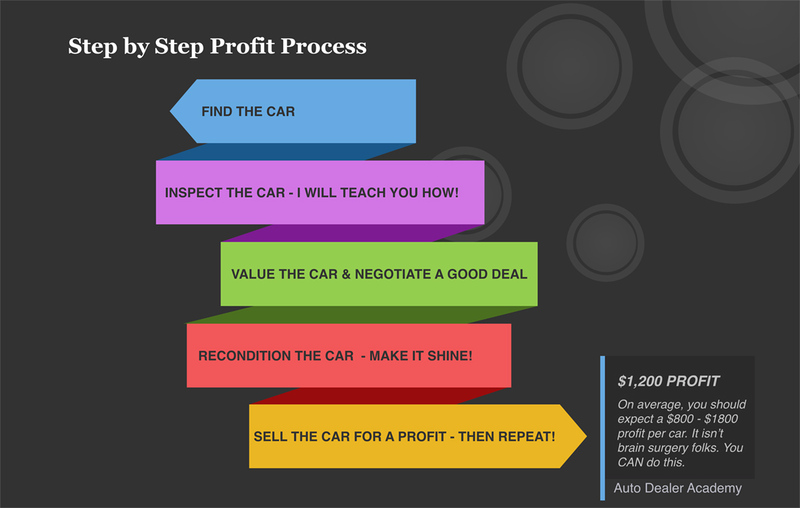 Allow to me outline my “Six Step Profit Process” that I cover in DETAIL in the Auto Dealer Academy’s Home Study Course. If you decide to attend the LIVE Dealer Auction Training, you will get HANDS ON exposure to this training! Deals are everywhere. You will discover all my favorite sources, there are 18 of them! 18 different places to buy cars cheap. And, how to find your own ‘honey holes’. 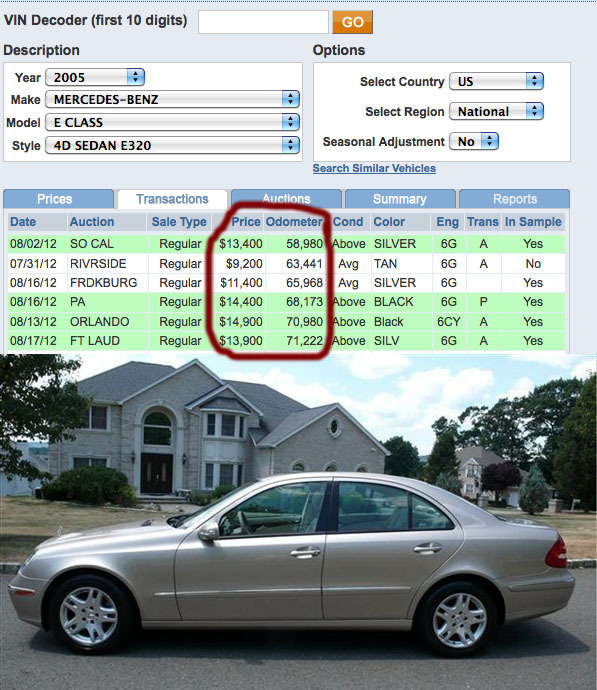 Everyone knows there are TONS of cars at dealer auctions IF you have a dealers license BUT the most profitable deals are NOT there – trust me! I will teach you where they are – you might be surprised. You do NOT have to be a mechanic to be successful in this business but do need to know HOW and WHEN to use mechanics, use pre & post sale inspections, how to avoid cars that have been in accidents (or floods), and more. This is very valuable and worth your careful study. This ALONE is worth the price of admission into the Auto Dealer Academy. “Be on the money!” What is the car worth wholesale and retail? If you can NOT accurately determine a cars value – WALK. That is your ultimate power – walking. I will teach you EXACTLY, and I mean EXACTLY, how to do this. With proper valuation models and methodology (combined with buying a nice car), making a profit just got a lot easier. If you wanna buy cars for cheap – you gotta be patient and smart. I will teach you all my strategies and psychology. Here is one for you: “Come on man, make me feel like I am getting a good deal. …” This works like a charm. AND, ALWAYS make the OTHER guy give you the FIRST number. If he gives a number FIRST, you are negotiating DOWN in price. If you say a number first, now you are negotiating UP in price. Think about it. “Make it shine”. You have GOT to know how to recondition a car. This means taking an ‘ugly car’ and making it a ‘pretty car’. Just cleaning a car and making it shine can make you $500 easily! Make it shine. Tip: Learn to use Adam’s Polishes with a porter cable buffer. Easy as pie. Money in the pocket. Learn how I advertise my cars for sale. TIP: I always use multiple places to advertise the car. I never rely on ONE method/location. You will learn that certain cars sell better advertised in different places. And…. don’t be greedy! Just sell it and pocket the profit. Repeat over and over. In general, I recommend cars that are mechanically sound. They are clean cars with nice curb appeal. Less than 10 years old with less than 150,000 miles. Buy it, clean it, sell it, & take the profit and re-invest it into the next car. I know a couple guys who literally started with just three cars and kept reinvesting their money into more cars and now own a thriving car lot. It can be done. To Summarize: First, find your local ‘HONEY HOLE” where you can buy all the cars you want (BTW, I will give you my recommendations on exactly which cars you should start with), then inspect each car carefully so you pick only the very best, value the car accurately to assure you have enough room for a nice profit, negotiate the lowest price possible, recondition it to maximize your retail sale price, and effectively market the car to sell it quickly so you can buy another one. Repeat over & over. George… I want to learn more! Question: Can you tell WHY you should avoid this car? Answer: Most likely it has been in an accident! Yes, I can tell JUST by looking at it. How? Well, look at the color! The SHADE of gray is different from the door and the fender! Why is the shade of gray different? It has been repainted! Why has it been repainted? I don’t really care why. I avoid it. Why avoid it? MOST paint jobs are horrible. There is crap in the paint. The clearcoat peels over time. The color difference gets worse. AND, it MIGHT have been in an accident. I don’t want MY family driving in a car that has been in an accident because once metal is bent (accident) and straightened (fixed), it is NEVER as strong. This is why I avoid it. And if you have ever owned a car that has been in an accident, it is just never the same. Avoid it. STOP RIGHT THERE. No NOT pass go. Do NOT collect $200. WALK AWAY from this CAR! I do NOT car HOW cheap it is! This is the NUMBER ONE MISTAKE new people make!!!. They buy a car with TOO MANY MILES! Stay away. Stay WAY away. IF YOU DO buy a HIGH MILE CAR PLEASE DO NOT CALL AND say “George, what do I do?”. It is hard to fix a mistake AFTER you purchased it. Set YOUR BUYING criteria in STONE and don’t deviate. IN the course, I give you MY recommendations on WHICH cars to buy and why! There are three primary ways of doing the car business. Each are a wonderful profit models. Be sure to explore these business models. Each offer their own unique set of opportunities and challenges. One will most likely ‘fit’ you perfectly. I prefer the auto broker model as I explain below. In actuality, many small dealers do ALL three models simultaneously. Learn them all. For example: Let’s say you auto broker a three old Camry for a local business owner (very good auto broker clients BTW), and take his 10 year old Corolla on trade-in. It is a nice little car with cold A/C, less than 120K miles, and all service records. So, you have a choice, either advertise & retail the car (my personal choice) or WHOLESALE the car. I recommend you take it to a Toyota dealership, get an glowing inspection report, advertise it locally & pocket the additional profit. From this example, you can see why you need to learn all the business models discussed below. This does not mean you have to own a ‘car lot’ on the main strip in town. You do want to have a car dealers license ot be “legit”. You just don’t need a “traditional car lot”. You see, there are plenty of stealth dealers who operate from a commercial warehouse. It is much cheaper too by-the-way. It is easy to flip cars on the side with the model I teach OR do it full time! Ok, I am about to burst someone’s bubble. This is NOT the place to start. This is a good ole buy network that takes time and money and to break into. Unless you know-a-guy who can introduce you and vouch for you, don’t even think about STARTING here. This is MY opinion. You can tell me to take a flying leap into the nearest lake but….. I recommend you get a RETAIL license WHILE building your wholesalers network. The full plan is in the studio course. To ME, this is the Holy Grail of car dealing. Hear me out. With ‘retailing’, you buy the car and hope to find the buyer for it. With ‘auto brokering’, you have the buyer and you buy them the EXACT car they want for a ‘fee’. This is the easiest of all the profit models with the BEST hours and the BEST clients. Of course, this is my opinion. I like buying cars that are ‘pre-sold’. Think about that for a second. No advertising the car. No meeting people for test drives. The financing is already done. AND, I sell an extended warranty in most cases too! Buy the car on Monday and deliver it by Friday. Once a local client of yours purchases a car without EVER having to walk onto a car lot – they are yours forever. You will buy their next car, their teenagers daughter’s car, his secretary, their neighbor, … this is a fantastic business worthy of serious study. I give you my entire blueprint to be successful. Take my advice: When you start people WILL say “If you come across XYZ car, give me a call, ok?”. Your response is, “I wish I could. But, I don’t shop for cars. I buy them for clients. When you are ready to BUY a car, let me know and I will get to work for you. I am able to find the exact care you want in less than 30 days in most cases.”. Remember that, you are a car BUYER. The Only One in The County! Howdy (said in my best Texas accent)! 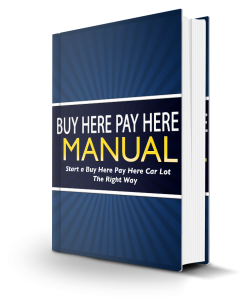 This Buy Here Pay Here Manual will help you add “buy here pay here” to your profit model without screwing it up. This Manual is 117 pages & the only one of its kind in the country. The truth is…. no one wants to tell you how to do it. This manual WILL get you going down the right path! I recommend starting small with just one car. Then do two cars, then three, then four. Make sure this business is for you! This ain’t for everyone! Before you know it, you will have 50 cars on the street.